This is STONIC’s top-of –the-line Model, ZEUS. 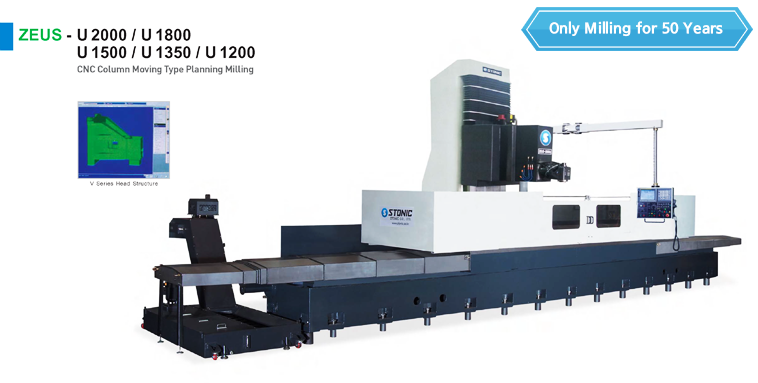 ZEUS is Single Column Milling Machine. The Length of Column to Spindle center is MAX 1,850mm which shows our core technology to prevent the head from drooping down as it usually does. But STONIC overcomes the limitation of norm with KNOW-HOW of their 50 years. STONIC has patents regarding this technology. That is why, ZEUS provides a unique solution of workpiece between 1,200mm and 1,850mm that the double column of machines usually do past. So ZEUS can be provided with half price of Double Column machine with the same Specification. And please take a note of other ZEUS’s amazing Specifications. Copyright (c)2014 STONIC All Right Reserved.